Fresh whole foods such as fruits and vegetables, dairy and meat, healthy oils, herbs and spices offer our dogs digestible, nutrient rich food without the dangerous ingredients, additives, toxins and carcinogens found in many pet store food products. My dogs get homemade cooked dog food in the morning and early evening and then, later in the evening they get their bowl of fresh food. It is best not to mix fresh fruit and fresh vegetables with your dog;s main protein meal – I will discuss the reason for that further below. Feeding your dog fresh whole foods as part of a balanced diet can have a profoundly positive affect on a dog’s overall health and can be a great aid in avoiding, treating and remedying many health issues – for example periodontal problems and GI tract problems. Meat is a rich source of protein, amino acids and contains many nutrients necessary for the health of dogs. Protein is the primary and species appropriate food for a dog. Dogs can survive without carbohydrates but they cannot survive without protein and fat in their diet. Organically raised, pasture fed chemical free (no antibiotics, no growth hormones, none GMO grain feed, etc) raised is always a better choice than meat coming from farms that use antibiotics, steroids, pesticide and herbicide, GMO feed. Some people like to feed their dog raw meat, while others prefer to provide their dog with cooked meat. I feed my dogs cooked meat rather than raw meat. My dogs also eat hard cheese, cottage cheese, yogurt and fish on a daily basis. For more information on appropriate fish, and how to select the best options you can go here. Nuts – organic, only, fresh not stale in small amounts. For information on seeds and nuts that pose serious danger to a dog’s health read here. Dairy products…Just like with people, some dogs are lactose intolerant. None of my dogs have any adverse reaction to cheese or yogurt. Yogurt is a good source of protein and also a source of acidophilus which helps to prevent the overgrowth of bad bacteria in the digestive track. Plain yogurt or yogurt with natural fruit sweetened with honey is best. Yogurt sweetened with sugar is alright but your dog does not require sugar. Yogurt sweetened with artificial sweeteners should be avoided. Xylitol is especially dangerous for dogs and can result in liver damage. Raw eggs…My dog’s get raw organic eggs – the entire egg (shell, egg white and egg yolk). Some people advise that dogs should not be given raw eggs due to the chance of salmonella poisoning. A dog’s stomach acids are stronger than a human’s and a dog produces more bile than a human does. While dogs are better at fighting salmonella than humans, dogs still get salmonella poisoning, but they can tolerate higher levels of salmonella than we can. Wash egg shell’s thoroughly prior to use. Also, it is important to note that eggs contain avidin, an enzyme that decreases the absorption of biotin (a B vitamin). Bioten deficiency can lead to hair and coat problems. Avoiding bioten deficiency is simple – make sure you always give your dog the egg white, and egg yolk. Peanuts and other nuts… Aflatoxins grow mainly on grains but they also grow on legumes – like peanuts, walnuts and pecans. Aflatoxins cause liver cancer. This is one reason why you will hear some people say do not give your dogs nuts. While there are some nuts that you should never give your dogs (like walnuts and macadamia nuts). If you want to give your dog peanuts or almonds make sure you use organic, human food-grade fresh nuts, never give your dog stale nuts. I have treated dogs for aflatoxicosis – it is a very serious condition. Too much protein? Yes, the ongoing debate about how much protein is too much for a dog’s diet. While I think it is best to provide a variety of foods to dogs, I think we need to fixate less on worrying about too much protein and be more concerned about the quality of the protein. In particular the protein source in kibble! Ingesting and processing high quality protein does not strain and damage a dog’s organs the way poor quality protein does. This is one reason why you need to be mindful of the protein source in the kibble you feed your dog. If you would like to learn a little more about this subject you can click here. Many people think that giving a dog fruit and/or vegetables will give the dog diarrhea. In actual fact high quality soluble fiber helps prevent diarrhea and constipation. Soluble fibers attract water and form a gel, which slows down digestion thereby delaying the emptying of the stomach and makes a dog feel full, which helps control hunger and weight. Slower stomach emptying can also have a beneficial affect on controlling blood sugar levels and insulin sensitivity, which helps control diabetes. Apples, oranges, pears, berries, cucumbers, celery, and carrots are examples of fruits and vegetables that provide soluble fibers. Insoluble fibers are gastrointestinal tract (GI Tract) friendly as they have a laxative effect, add bulk to the diet and help prevent constipation. Insoluble fibers do not dissolve in water, so they pass through the GI tract primarily intact speeding up the passage of food and waste. 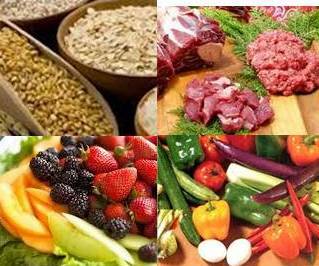 Insoluble fibers are mainly found in whole grains and vegetables zucchini, celery, broccoli, cabbage, tomatoes, carrots, cucumbers, green beans, dark leafy vegetables, fruit, and root vegetable skins are examples of fruits and vegetables that provide unsoluble fibers. As noted above, fruit and veggies contain a lot of good soluble and unsoluble fibre, but they are also rich in vitamins, minerals, anti-oxidants and are naturally low in fat while being filling. Inflammation of joints is another contributing factor to the onset of cancer. In the wild, dogs eat pre-digested fruits and vegetables when the consume the digestive organs of herbaceous prey, as well they also consume some plants, fruits, vegetables to self-heal and boost their immune systems. Grass is one such example. The fruits and vegetables that I give to me dogs on a daily basis vary a little depending on the season, for instance watermelon in the summer and oranges in the winter. The following provides a partial list of fruits and vegetables that are good for dogs. You can use fresh, canned or frozen fruit. If you are going to give your dog canned fruit, make sure it is packed in juice not syrup – sugar is not good for dogs. You can use fresh, canned, frozen and/or cooked veggies. Avocado – in small amounts daily is fine for most dogs. Avocados contain persin – a fungicidal toxin. When a dog is fed large amounts of the fruit vomiting and diarrhea can result from overdose of persin. The pit of the avocado is toxic to dogs and should never be consumed by dogs. Sweet Peppers – green, yellow, orange and red, purple, etc. Mushrooms – Chaga, Maitake, Shiitake, Reishi and several others. Please note many other types of mushrooms are toxic to dogs, just as they are to people. Make a smoothie as per the example just below. You greatly reduce the chance of your dog choking on a hard piece of vegetable. I add fresh finely minced ginger and ground cinnamon, and sometimes mint, fresh apples, pears – toss the mixture into the food processor and blend the 3 or 4 items together. Don’t mix fresh whole or coarsely cut fruit and veggies with a main protein meal. Use thawed frozen fruit or veggies. As mentioned above do cut/chop/shred fresh vegetables into small pieces – a food processor is great for finely chopping fruits and veggies. As explained further above a dog cannot properly digest uncut, whole fruit and vegetables . Larger pieces of vegetables and hard fruit pose a choking hazard. Zoey quickly became unconscious and if I had not known how to and did not administer the Heimlich manoeuvre and mouth to mouth resuscitation he would have died in front of my eyes. When you introduce new fruits and veggies to your dog’s diet it is best to introduce each new food one at a time. If there is any kind of negative reaction, such as stomach upset or allergies you will be able to pinpoint the culprit. None of my dogs have any allergies to fruits and veggies. People have used herbs and spices to add flavour to food and to treat ailments for thousands of years. So it should not be surprising that there are many herbs and spices that are good for our dog’s health. Herbs and spices can boost the immune system and are rich in vitamins, minerals, antioxidants to name just a few benefits. If you would like to find out more about herbs and spices you can add to your dog’s diet click here. Herbs such as Turmeric and/or Curcumin can also help your dog loss weight and maintain a healthy weight. In some such cases one of the only food items the dog can still tolerate are grains such as rice. Make sure that you only provide your dog with human quality grains. If the grains are not human grade they can contain aflatoxins. Grain that is sold for bird and livestock feed, grain that is used in most commercially manufactured dry and wet dog food is animal feed grade and is not screened for aflatoxins. Always cook the grains. Grains absorb liquid, so ingesting uncooked or grains that have not been pre-soaked can lead to swelling and bursting of the stomach…dangerous at the least, lethal at worst. Grains can be completely replaced by (for example) substituting a combination of sweet potato, squash etc. as demonstrated in this recipe for homemade dog food. Omega-3 and Omega-6 fatty acids are very important for the overall health of a dog. However the intake of Omega-3 and Omega-6 must be balanced correctly. The ratio should be in the range of 2:1 for Omega-3 to Omega-6. An out-of-balance ratio can disrupt the balance of pro and anti-inflammatory agents in the body and brain resulting in chronic inflammation and elevation of the risk of health issues such allergies, arthritis and diabetes and can adversely effect behaviour. To read more about the importance of Omega Fatty Acids, what is a balanced intake and what are good as opposed to poor or dangerous sources of these vital nutrients you can read this article. Minerals such as calcium, you may also need to add vitamins such as A, B complex and E and enzymes depending on the type of food you make. If you would like to learn more about making your own dog food you can try these simple to make recipes for nutritious homemade dog food. Hi Karen – I tried the fully cooked version and my dogs loved it. One of my dogs had a vet check-up and the vet asked the routine “what diet are they on?” and I showed her the recipe. She said I should be cautious because there is no way to know the nutritional analysis of the recipe and therefore it may not meet all of their nutritional needs. I still prefer the idea of providing whole foods but want to be sure they are getting everything they need. Can you tell me the nutritional values of your recipe? if i make a smoothie out of raw fruits and veggies i still cant mix with the dogs food correct? only if its lightly steamed? and if i add powdered superfoods can they be added to protein mea,l or given separate also? Would it be alright to combine fruits and vegetables with my dogs dry food or would it be to difficult to determine how much I can put? Yes it is OK provided that you prepare the vegetables and fruit as I have instructed in the article above – when not prepared as noted the absorption of nutrients from the main food – in your case dry kibble – can be seriously hampered leading to health issues. Amount – 15% to 20% veggies max to dry kibble in a combined meal. Karen, on behalf of my husband and I, our dog Bella, and “natural pet parents”, just want to say a big THANK YOU for your wonderful website and sharing your knowledge! I wanted to get your thoughts on something if you have time! Bella eats a home cooked diet, and while she absolutely LOVES vegetables, when it comes to fruits, she just won’t eat them…at all! We’ve tried your suggestions as well making a purees of fruits to mix in with her meals, all with no success. If she even detects (or suspects, lol!) fruit puree has been mixed into her meals, she will walk away and not touch her food! I found this when i was looking up what was okay to give my dog…can i give my dog garlic?? Onions, Garlic, Chives – can cause the destruction of red blood cells known as Heinz body anemia, a form of hemolytic anemia. No clear quantity has been established as to the onset of the anemia. But for garlic, if your dog consumes the equivalent of 1 teaspoon of garlic for every 10 pounds of their weight (1 teaspoon for a 10 pound dog) it can destroy red blood cells. Poisonous reaction can result from raw, cooked or dried onions, garlic, chives, including those included in powdered or dehydrated forms. This is such a wonderful resource! I was wondering, what fruits and veggies can I dry-out as Chewy-Treats(if any)?? Thank you so much for all of the Information! Great article thank you, my norwegian elkhound is ten years old, and gaining weight, so I have cut the amount of kibble and add mackeral, fish or chicken to his feed but having read your article I think I should omit the kibble and feed him twice a day one protein meal and one veg/fruit meal. Yes you could omit the kibble and give him a better alternative that will help him lose and maintain a healthy weight. I have been feeding species appropriate raw food diets to my pets for almost fifty years now. The “species appropriate diet” for carnivores includes raw meat, eggs, canned sardines or salmon, ground bones or bonemeal supplement, organ meats, and a small amount of pureed vegetables (optional), No carnivore should be eating sweetened yogurt or legumes (which are starches). The reason nutritionists warn against feeding raw eggs is to avoid biotin deficency, not salmonella poisoning. Raw eggs receive a caution for two reasons – Contain an enzyme called avidin, which decreases the absorption of biotin (a B vitamin). This can lead to skin and hair coat problems. Raw eggs may also contain Salmonella, although the chance of contamination for your dog is low as a dog’s stomach acids are very strong and dog’s also produce a lot of bile. You can cook the eggs to avoid this issue. Due to the avidin it is best not to give eggs every day, but a couple of times a week is fine. The species appropriate diet can also include other healthful supplements – herbs such as turmeric http://ottawavalleydogwhisperer.blogspot.ca/2012/11/turmeric-and-curcumin-good-for-your.html additional omega-3 fatty acids. Another very important point to consider when feeding raw is the source of the meat. If the meat is obtained from animals that are fed GMO corn, antibiotics, growth hormones etc. the raw diet can be very compromised. There are many things to consider when putting together a good raw diet. Also interesting – some dogs will pick their own wild berries, juniper berries, apples, and in the case of a vegetable garden – their own vegetables – tomatoes, peppers etc. I have ten dogs – different breeds and sizes and many of them, in addition to eating grass (the blade, not the seed) will pick their own fruit in the meadow portions of my trails. They do this not having been shown to do so, but instead naturally on their own. The species appropriate diet is not so narrowly defined as some would have it expressed. To get her interested in veggies – You can lightly steam the veggies, or finely chop fresh veggies – drizzle some olive oil on top with some grated cheese or cottage cheese. I bet she will be interested in these options! She still needs to put on weight and unfortunately I Also live in a vegetarian household so it’s hard for me to incorporate meat into her diet as much as I’d like to. I’m lucky to have friends that will cook a few meat based meals for her when we visit during the week and keep my supplied with regular chicken stock. A lot of dogs here in India are vegetarian but I’m not sure if that’s the way to go. If she is eating cooked fruit and veggies that is great! As you read in the article above it is best to perform the first part of the digestive process for veggies particularly – by lightly cooking them of flash freezing them. -as long as the coconut is organic…as if not the shell may have a high-content of pesticide residue. Thank you! There’s so much to read here, and it’s what I’ve been looking for. Both my dogs have issues that I think could be solved by improving their diet. My vet is NO help. How about raw diet? Commercial raw food meal all have fruits and veggies mixed in? Is it still better to separate protein from veggies? The fruit and veggies found in commercially prepared raw food has already been flash frozen or cooked. The meat is raw. Thank you for this very comprehensive, helpful article. I did note one error. Under the section FATS, you say that the proper ratio of Omega 6 to Omega 3 is 1:2, which I believe is backwards. In your article Omega Fatty Acids for Dogs, as well as elsewhere, I’ve seen the ratio noted 2:1 (even 3:1) Omega 3 to Omega 6. Since the ratio balance is critical not only for good health, but safety and not causing a health problem, I thought it was important to mention this so that you could make the correction. Given the breadth and depth of information you cover on your blog, I imagine people see it as credible and place total trust in what they read. For the reader who only reads this article, they will get the ratio wrong, and I know none of us would want that. Thanks for your great work! Keep it up. I currently make my dog’s meals. I usually combine the veggies with cooked chicken – Should I just give her chicken in AM and veggies in PM? I am confused by your section on the absorption of nutrients. I’m confused as to exactly what is included in their “fresh food” that you give them later in the evening. I see the recipe for the homemade food and the homemade treats, but not the fresh food. Fruits, veggies/fresh herbs, garlic, aloe vera juice, rooibus tea, yogurt or kefir, sauerkraut. Rooibos Tea for Dogs – Immune System Health, Cancer Inhibitor, Allergy Mediator and free of oxalic acid. Flax, coconut oil, fish, turmeric, papaya, cinnamon, olive oil etc. is provided with their dog food. Thank you so much for this article! I am in the process of switching my dogs over to fresh food, and I will be referring to this article a lot. I love the picture of all of your dog’s bowls lined up. So cute. What lucky dogs you have! This is a thoroughly researched and intelligent article for anyone considering upgrading the food their dogs eat. It should be recommended by veterinarians knowledgeable about canine nutrition!